It is estimated that nearly eighty percent of people experience back pain at some point in their lives, and approximately 20% of the population has back pain at any given time. Potential injuries to the low back include ligament sprains, muscle strains, facet and sacroiliac (joint) irritation, arthritis, stenosis, and the ever infamous disc injury. While disc injuries are highly feared, it is now known that disc problems make up only a small portion of the causes of back pain, and that surgery is rarely required. 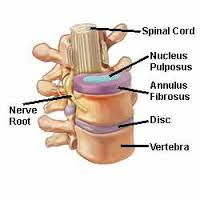 Spinal discs separate the vertebrae (bones) of the spine and are made up of two main parts; an outer layer of fibrous rings known as the annulus fibrosis, and an inner gel like structure known as the nucleus pulposus. The central nucleus acts as a shock absorber against everyday stresses, and impact, while providing a pivot point for spinal range of motion. The outer annulus of the disc connects to the top and bottom of each vertebra, acting as a ligament to help stabilize the spinal column. It is the interplay between these two parts that make the discs both resistant to and susceptible to injury. 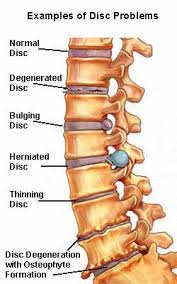 Common discs injuries include disc bulges, disc herniations, and degenerative disc disease. Disc bulges result from small tears in the outer most layer of a disc, and can result in pain for a brief time. Disc herniations are usually a more significant injury in which the tear in the outer disc is much larger. Inflammation around the nucleus (center) of the disc causes the inner material to leak outward through the tear. This herniation may be painful, and may also result in nerve tension signs such as numbness and tingling into the arms and legs. Research, however, shows that while an individual may have multiple disc injuries, these injuries are not always the source of the person’s pain. As such, while an MRI is useful in confirming the presence of a disc injury, a thorough physical examination should be performed to determine the true source of the pain. Degenerative disc disease (DDD) is the most common disc injury in adults, and typically occurs as the disc dries out due to the natural aging process. 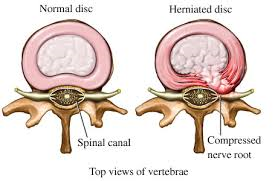 As the discs become thinner and thinner, the vertebrae typically form bone spurs/osteophytes (forms of arthritis) to improve stability of the area. While research shows there is a genetic component in developing DDD, it is also believed that every day “wear-and-tear,” along with trauma, makes certain areas of the spine more likely to develop DDD. DDD can often be seen on plain film X-rays. 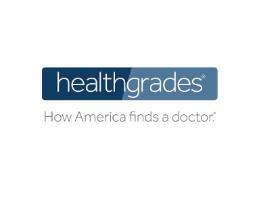 Luckily, in most situations, disc injuries are easily treated with conservative care. It is estimated that nearly 80% of disc bulges, and herniations, will undergo reabsorption, in which the leaking material will return to the center of the disc (if properly treated). Conservative care includes the use of ice, exercises to promote healthy/pain-free movement, nutritional support, and chiropractic manipulation. The chiropractic adjustment creates a negative pressure within the nucleus (center) of the disc and helps to promote reabsorption of the inflamed material. While the focus of this article has been on disc injuries as they relate to low back pain, it is important to note that disc injuries may also occur in the neck. A recent study, published in the Journal of Manipulative and Physiological Therapeutics, found that spinal manipulation for acute, sub-acute, and chronic patients with cervical (neck) disc herniations produced significant improvements in symptoms with no adverse effects. In most circumstances MRIs, spinal injections, and surgery are not necessary in the management of disc injuries. However, should you experience loss of bladder control, an inability to urinate or defecate, severe numbness through the groin region, an inability to walk or use your arms, or fever along with back pain, it is important you seek medical attention immediately.